Taking care not to wake anyone, the traveller crept back into the house, shielding his candle. In the scullery, he rinsed the last traces of blood from his hands and dried them on a cloth. He felt for the leather sheath sewn into his tunic and slid out a flat shard of bone, smoothed and sharpened to a point at one end and carved into an animal's head at the other. This sequel to The Blackhope Enigma is imbued with alchemy and intrigue. During what seems like an ordinary museum visit, tour guide Throgmorton lures Sunni and Blaise through a painted doorway into eighteenth-century London. When Throgmorton demands secret information from the pair about their Blackhope escapades, they attempt to flee, encountering body snatchers, art thieves and forgers in this gripping time-travel adventure. If you are a regular follower of my blog, you will know that I read and reviewed The Blackhope Enigma last week which is the first book in this series. Normally I avoid reading books in a series back to back, so this was a first time for me in absolutely ages. 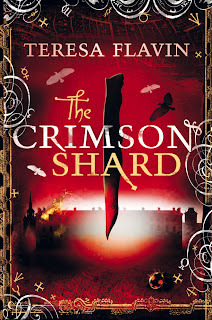 I always worry that I will become bored of the characters if I go straight into the next book; luckily this did not happen with The Crimson Shard and I would say that I actually enjoyed it even more than the first book. 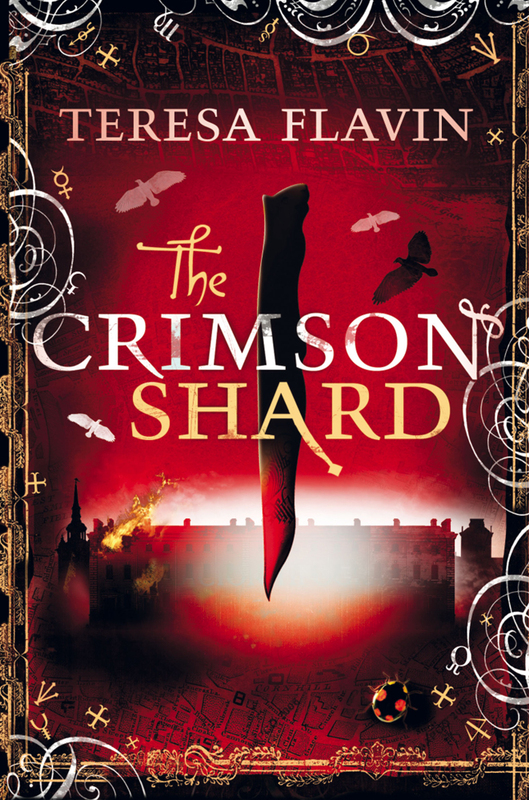 For a start, this book takes our time travellers Sunni and Blase, through a door into the 1800's, which is always a favourite period of time for me. It was lovely to see that Sunni's blooming friendship with Blase, depicted in the first book had moved onto a budding romance. I can't wait to see where their mutual admiration takes them in the future. Sunni is just a fantastic character,who never admits defeat. I loved the Shakespearean twist as Sunni is made to dress like a boy; a situation I felt she handled very well. I was actually quite glad to see that Dean, Sunni's younger stepbrother did not feature in this book, as I did find him slightly annoying in the first book. He was just too whiny and a typically annoying young brother to me; just not built for exciting adventures through time. Although this book is a sequel, it does not run with a tried and tested formula. It is completely different from the first book, leaving you wondering what to expect. Definitely a refreshing change to many books appearing in the series format. I loved the way that hidden loose threads from the first book, found themselves woven into this story. The first book left no cliff hangers, yet this book actually discovered some hidden ones and brought them out into the open for everyone to read. Very clever move, Teresa Flavin! I get the impression that the author has a great love for art, because the way she describes it really brings it to life for me and intrigues me enough to want to visit an art gallery. Normally paintings wouldn't appeal to me in the slightest, but this book has made me view paintings in a whole new light. I have a little niggle with the book. I found I got a little confused with the characters. When the group of Victorians came to their rescue, I did get a little lost as to which one was which. I felt we were introduced to a succession of people very quickly, who were not always clearly distinguishable. This reminded me of a similar problem I had with book one where confusion hit me. Although it could just all be my age and short attention span! Other than that, I felt that this book was an excellent sequel to its predecessor with a refreshing use of time travel. I can't wait to read the next one. First things first ..... I'm loving the new look to your blog. Glad you enjoyed this sequel, I'm awaiting a copy of the first book which I have reserved at the library. Oh wow, for a moment there I wondered where I was. I love the new look, Lori is amazing! wow it's beautiful. Love the new blog design. I meant to say something about the review when it dawned on me, the blog is totally new! Lol, I think I was too surprised, it looks great! Vivienne, I love love love your blog's new look! I'm glad you enjoyed this book for the most part. great review Viv! :) I loved this one too, and love how much the authors passion for art comes out as well!